Comedian Marc Yaffee lists why Mario, Link, Ryu, Pac Man and Kratos will have difficulty in picking women up. 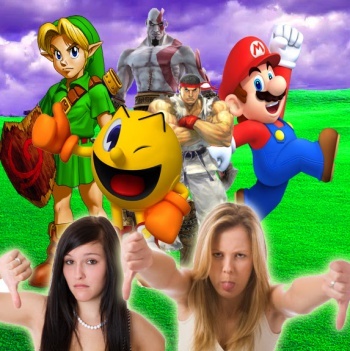 Just in case you haven't read enough video game lists, comedian Marc Yaffee (Comics Unleashed) has one of his own, and this one gives us the reasons "Why Five Iconic Video Game Characters Would Have a Difficult Time Picking Up Women." Mario (Super Mario Bros) - Yes he's a plumber so steady employment is a positive however, the only way he can become "super mario" is by taking what can only be considered a psychedelic magic mushroom. In addition, Mario regularly stomps on turtles which many women might find to be cruelty to animals. Also, his mustache is so 1980's. Link (Legend Of Zelda) - Link would have a very difficult time picking up women because he's too much of a nice guy and women need a challenge in a man. In the original Legend of Zelda, Link fought through eight dungeons and after beating the evil Gannon at the end, Zelda didn't even kiss him! At the ending of Zelda II when the curtain falls and we're all suppose to presume he's kissing Zelda and it's not true - she's actually telling him at that moment that they should be friends. Pac Man - He eats 24-7 and his skin complexion is purely yellow which means he probably has an underlying serious health issue. Also, Pac Man only becomes powerful when he eats the "power pellets" - meaning he doesn't have the power from within. A lot of women would see that as a turn off. Also, when Pac Man does eat the power pellet and has super abilities does he save children, does he have the world, does he help grandma across street? NO. Pac Man eats ghosts who then regenerate and angrily try to get him. No self respecting woman would ever tolerate this type of insane behavior. Ryu (Street Fighter II) - Ryu has got an incredible physique and he can shoot fireballs from his hands - those will definitely grab the attention of the ladies however, it's all downhill from there. Ryu is completely focused on his craft as a fighter and doesn't particularly have a fun or engaging personality. At the end of Street Fighter II, his buddy Ken who has similar talents grabbed the girl of his dreams, got married, and enjoyed life. At the end of Street Fighter II Ryu didn't go to one party or flirt with one woman and instead he spent the next few months doing dragon punches in a waterfall. Ryu also never smiles, he's always moody, and he's is destined to remain alone forever. Kratos (God Of War) - Kratos has proven in the God of War games he's great with the ladies and he's beaten all the gods on Mt Olympus so why is he on this list? Well, he killed his whole family. Even if it was an unintended accident, most women would find that an immediate deal breaker and would not date Kratos. Also, Kratos has a ton of emotional baggage plus, his skin complexion is grey and we've never seen Kratos crack jokes. Women tend to like men with a sense of humor who haven't accidentally killed their whole family. According to his bio, Marc Yaffee is heard on "hundreds of radio stations" across the country and is a "laughter powerhouse." He has also written for George Carlin's Laugh.com and appeared on the TV shows "Loco Comedy Jam, Latino Laugh Festival and Que Locos. So, what do you think? Do you agree with his choices or should Yaffee stick to comedy stuff not based on video games? If you had to make your own, which top five characters would you pick?